This is my first unlocking guide for Navigon 2100. It is base upon the Mio C230 unlock release 4.1. What’s new is My Apps (WolfNCU) which lets you add your own programs to the desktop easily. A skins swticher is also included for you to switch skins for MN6. BEFORE YOU FOLLOW THE PROCEDURES TO MODIFY YOUR PNA. YOU KNOW THAT YOU MIGHT RENDER YOUR PNA UNUSABLE AND YOU MIGHT VOID YOUR WARRANTY. YOU DO THIS AT YOUR OWN RISKS. THE FOLLOWING STEPS HAVE BEEN TESTED ON US MODEL OF NAVIGON 2100 ONLY. THEY ARE NOT MEANT FOR NAVIGON 2100 PURCHASED IN OTHER COUNTRIES EVEN THOUGH THEY MIGHT WORK. Before you begin, make sure you read the post entirely and you have no questions about each step. A little background might help you understand what you are doing. At startup, Navigon executes autorunce.exe which invokes MN6, the navigation software for Navigon. 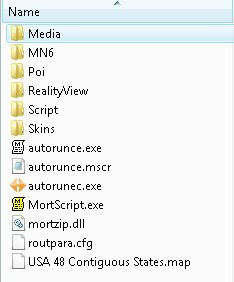 We just change the name of the original autorunce.exe and put our unlocking script in its place. This way we trick the Navigon to run the unlocking script. Put the SD card that comes with Navigon into your computer’s card reader. If you don’t have a SD card reader, you can connect your Navigon to the computer directly using a mini-USB cable(not included). Change the file autorunce.exe on the SD card to autorunec.exe. Unzip the file and copy everything to the SD card. Note that if you already have a Skins directory, just copy the content of Skins directory to your existing Skins directory. Here is a screenshot of the folders and files on the storage card’s root directory. Put the SD card back to the unit. Turn it off completely by pressing and holding the power button for a few seconds. Turn on Navigon 2100 by pressing the power button and holding it for a few seconds. A dialog pops up telling you the unlock is done and begging for donation. 🙂 Click on OK to continue. Toggle Screen Orientation: Toggles the screen between landscape or portrait mode. Taskbar: Brings up the taskbar. Toggle Keyboard: Toggles MioTool(keyb.exe) which you can use to open an on-screen keyboard. You need a stylus to us it. Make sure the cursor is in the input field of the window when you use it. Tap the ab icon again to close the on-screen keyboard. Volume: Changes the volume. The default volume is set to maximum. You can use this to change volume before playing a game with sound like Tetris. 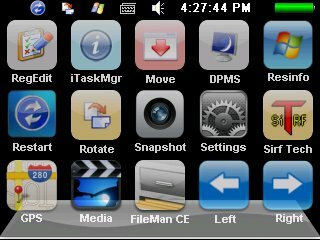 FileMan CE: Invokes FileMan CE, a file manager for CE devices. You can use it to launch other programs not on the desktop or manage files. Paint: Invokes PocketPaint. This is a simple paint program. Notes: Invokes NotePad, a notepad program for creating/viewing text files. Tweaks: Tweaks Management. I have modified a MioMap Skins switcher to switch MN6 skins. uBook: uBook reader. It can open HTML, TXT, RTF, PDB and PRC (not secure) ebook files. A free Webster dictionary is included. I don’t know if anyone is interested in reading a dictionary, but it’s there. NoniGPSPlot: A straight line GPS application. 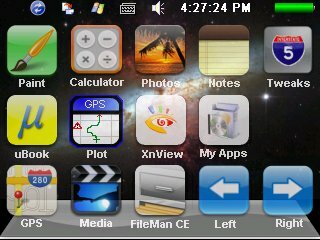 XnViewPocket: Image viewing application. You can use it for photo slide show. My Apps: If you want to add your own programs, this is the place. In this desktop, there are a lot of new games. Most of the games are from XFlib. If you like the games, please consider a donation to their site. You can download a lot more games from the site. Some games run in portrait mode. Ameridan has come up with a way using scripts to rotate the screen automatically. I have borrowed the scripts to run these games. Lights On: Invokes LightsON. The goal of the game is to turn all lights on. Sudoku: A Sudoku game from XFlib. Caisses: A Sukoban clone game from XFlib. HexaVirus: My personal favorite from XFlib. Your goal is to active every virus in 30 moves or less. Aquella: A JezzBall-like game from XFlib. BallBreaker: An interesting game from XFlib to test your reflexes. All the balls are shooting at your cursor. Try to lure the balls to hit the block(s) and break them. SmartMahjongg: My favorite PocketPC game. It’s now possible now that we have .Net compact framework 3.5. The game is a bit slow to load, please be patient. If you like it, please consider a donation.  This is the author’s site. Tetris: A classic Tetris game. Click on the block to rotate it. Click on the left or right side of the window to move the block. Shift: Another game from XFlib. Click on the border of the screen to move the blocks that can move in the direction. When 3 or more of the same block form, they disappear. RegEdit: Registry editor for your PNA. iTaskMgr: Shows you CPU, Process and Task(Application) info. You can use this to terminal a process or switch to an application. Move: Utility to move windows around. DPMS: Turn your screen off. Restart: Restarts PNA. Use this when an application crashes or after you load new files to the SD card. Rotate: Rotates the screen counter-clockwise by 90 degrees. Settings: Invokes Control Panel. Note that some of the settings might mess up your unit. Please use it with caution. SirfTech: Utility to manage settings for GPS. Can be used to turn off static navigation. This program is NOT included in the package. Please download it from the author’s site. If you want to use your own background image, just create a 320×240 bitmap file. Put them in the Scriptdesktop directory. Edit the ini files in the directory to use the bitmap file you created. main.ini is for Main desktop, gmaes.ini is for Games desktop and utilities.ini is for Utilities desktop. Change the variable BackgroudBitmap to point to the new file. If you want to change or add the icons(shortcuts) on the desktop, you can do so by editing the files in note #2. An icon entry is like this. When you have the program and icon(64×64) ready, copy the program to Script directory and copy the icon to Scriptdesktopicons directory and modify the variable Command, IconNormal and IconPushed. Note that you have to use absolute path for Command, but use relative path for IconNormal and IconPushed. If you follow this rule, you can use the included SystemInformation32.exe in that directory to test the desktops on your computer. This tool is very useful for those who like to change the desktops frequently. I have commented out some of the ICONXPBUTTON sections on the ini files. If you want to use them, remove the # signs in front of the lines. If you experience programs with your unit, you can hard reset the machine using the power button on the top. The use of unlicensed maps is illegal. Please don’t ask me where can you get maps not licensed for your device or how can you get MN6 to recognize the unlicensed maps. Any question regarding unlicensed maps will either be deleted or ignored. If you don’t like it the way it is, you want to undo everything. It’s very easy to revert back to the factory state, just delete all the files you copied to your unit and rename the autorunec.exe back to autorunce.exe. Hard reset your unit afterward. If you find my articles useful and you would like me to continue this project, please consider making a donation to my site. Thank you!